A Vegas Girl at Heart: Austin's Baby Album (Part 1 of 3) - Photo Heavy! 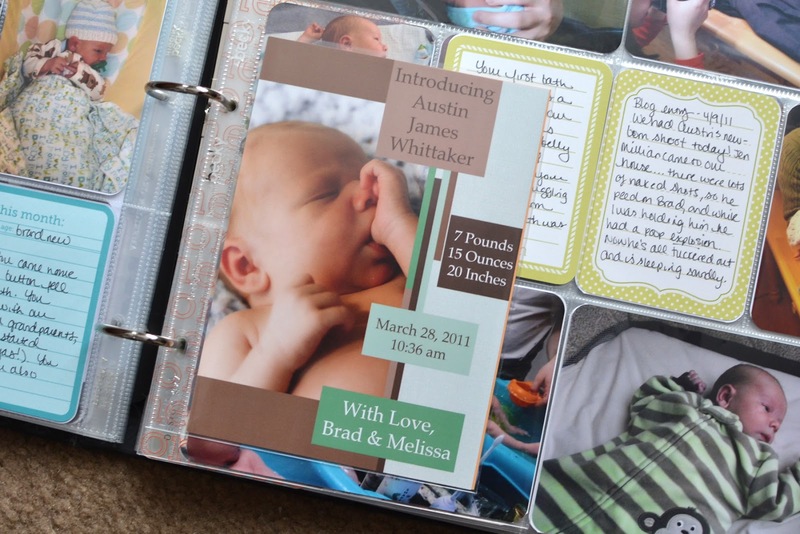 Austin's Baby Album (Part 1 of 3) - Photo Heavy! 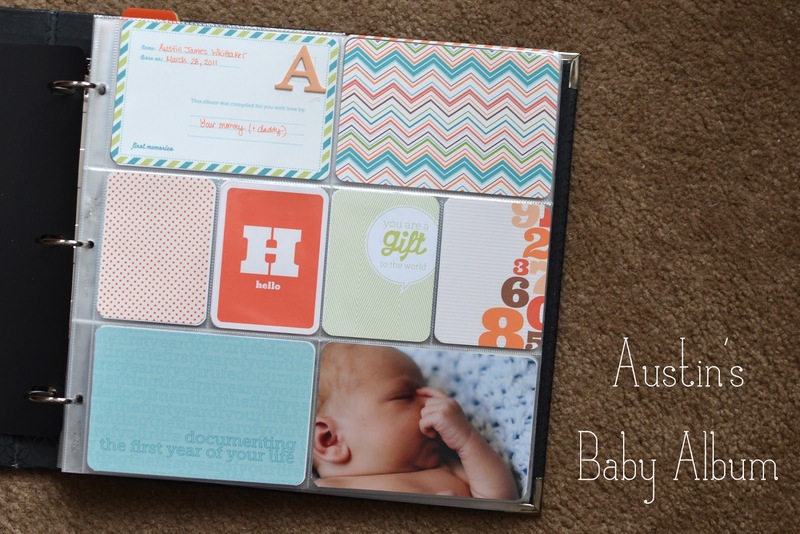 I'm so excited to share the first part of Austin's baby album, up through his first month. I'm planning to split the album into three posts, so that I don't overwhelm you with photos of the entire album all at once. And this also gives me a little more time to complete the album to my satisfaction. I have so many projects I'm working on (really, really trying to cut that down) that it's better for me to break this one up into segments and work on completing it at a slower pace. 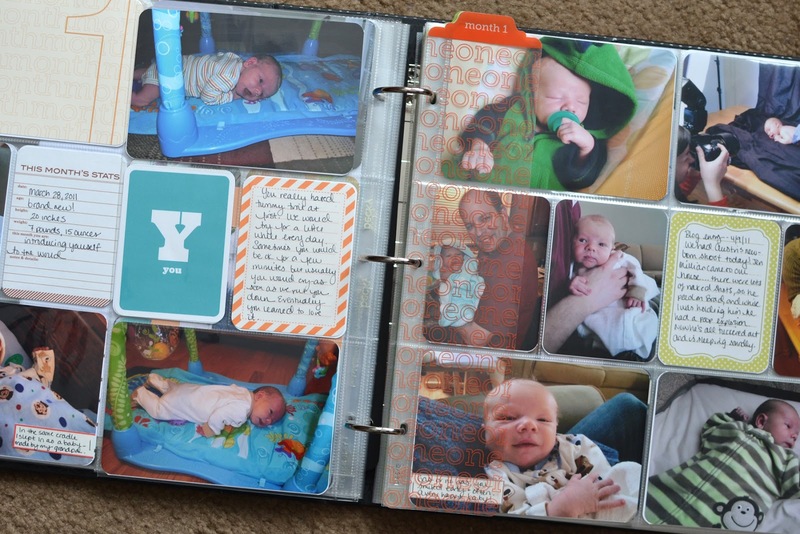 I am using the Project Life Baby Edition For Him, in digital format from AC Digitals. However I am doing a physical album. I love having the elements in digital form, because I can print only the cards I want to use (there are many that don't apply to Austin), and reprint them as many times as I want (great for those fun, unthemed cards that can be used in your everyday albums). The digital kits come with printable PDFs, so you don't even need Photoshop to print them and use them. They're gender neutral on the prompt cards, so you could use this kit for girls, too, if you like the colors. And there are so many cards, for every situation it seems, you'll probably have a few you don't even use! I know I didn't use many of the Time Capsule cards, simply because I was too lazy to look that stuff up. I printed my cards using my Epson Workforce 630 (here's a link to the 635 on Amazon, on sale for $99 as of last night), using regular paper settings, fine quality (NOT photo), and no color correction. I printed them on white card stock. Then trimmed them out with my paper trimmer, and used a corner rounder to round the corners. I just took some orange card stock, stuck it on top of part of a chipboard coaster, and ran it through my Big Shot using these Sizzix Typeset Alphabet dies from Stampin' Up!. Love the Story of Us page. 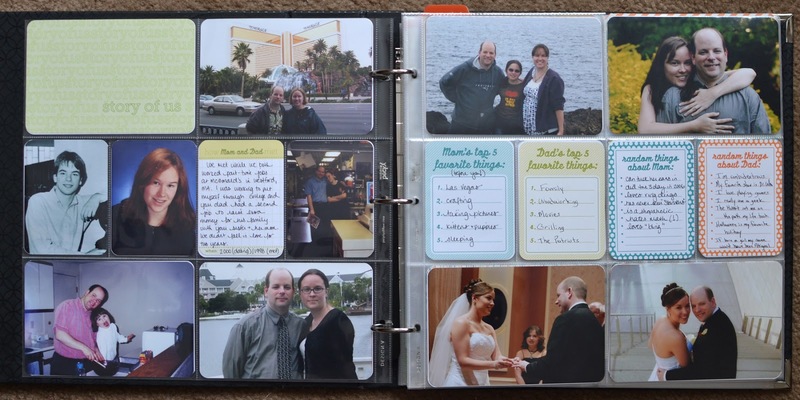 It was so fun to find photos of us throughout our relationship and add them in along with some journaling about how we met and some special things about us. Ah, my favorite part. (Not so much). Pregnancy. 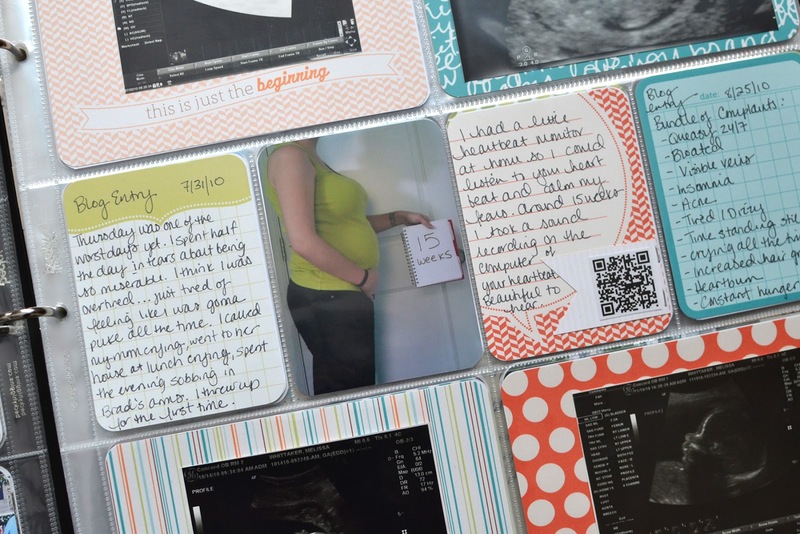 Fun to document, I suppose, but if you're new to my blog, you may not know that I hated every minute of being pregnant. I included various photos from throughout the pregnancy. Not every bi-weekly belly photo I took, because I documented my entire pregnancy in a mini album. A shot of us the weekend we conceived, the obligatory pee-stick photo, one of us in Disney at 28 weeks pregnant. 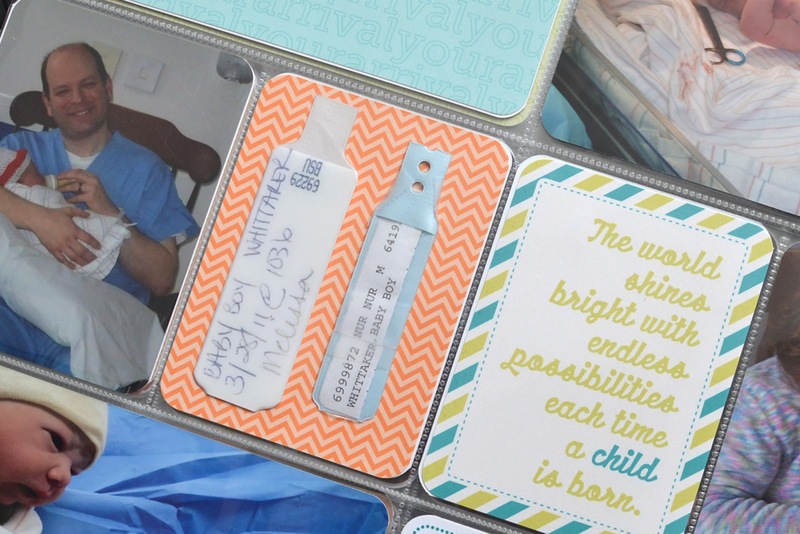 (By the way, the little label over the photo was one I made, and you can download a free printable of coordinating Baby For Him labels right here). I went back into my Facebook page and printed out a screenshot of the announcement of my pregnancy to include in the album. I added excerpts from some of my blog posts from when I was pregnant. They weren't very happy, but I want to remember those details, even if they're unpleasant. I also added a video recording (sound with my belly picture as the image) of Austin's heartbeat. Decorating his room, more blog excerpts, and all about how we chose his name. A pre-pregnancy vs. induction day photograph to see how big I got. Need to still add the video of Austin kicking in my belly here, so I just inserted a little slip of colored paper as a reminder. I wrote a letter to Austin on this journaling card because the blog excerpts I included were all pretty negative, and I don't want him to think that he wasn't worth it. Every second of the pain and unpleasantness I went through, I would do again for him in a heartbeat, and I wanted him to know that. The baby shower! 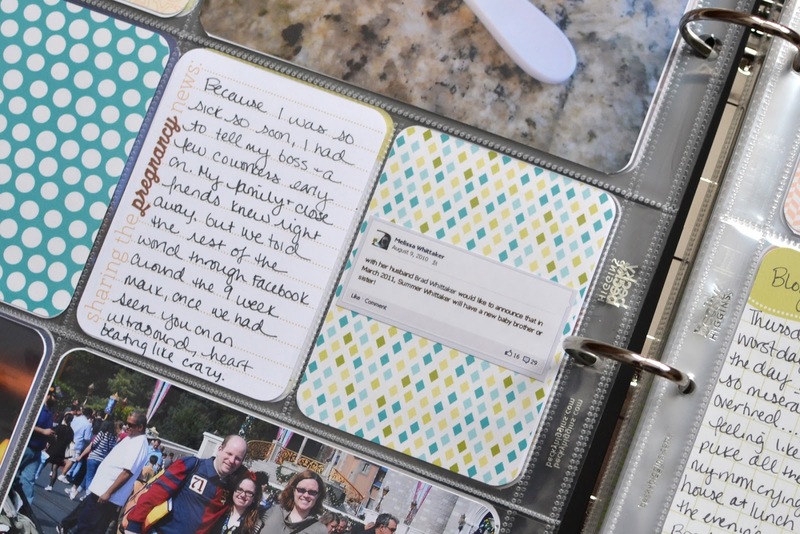 So fun, so many pictures, I only had room for one journaling card. I really wanted to get some special people into the album. And of course I had to include a shot of Austin's room after the shower with all of the gifts. It was fun organizing them all and putting them away. My favorite page, Austin's birth day. :) I love the colors in this page and how everything came together. It's perfect. I love how I found a photo on my mom's camera of her holding Austin the day he was born, while I was probably sound asleep across the room. I think Brad took the photo (he must have, but he doesn't remember it). I'm SO thankful I found it. I included Austin's and my hospital bracelets. Very special to me, and it's awesome to see the comparison in sizes. A special card from a special friend I received on the day Austin was born. 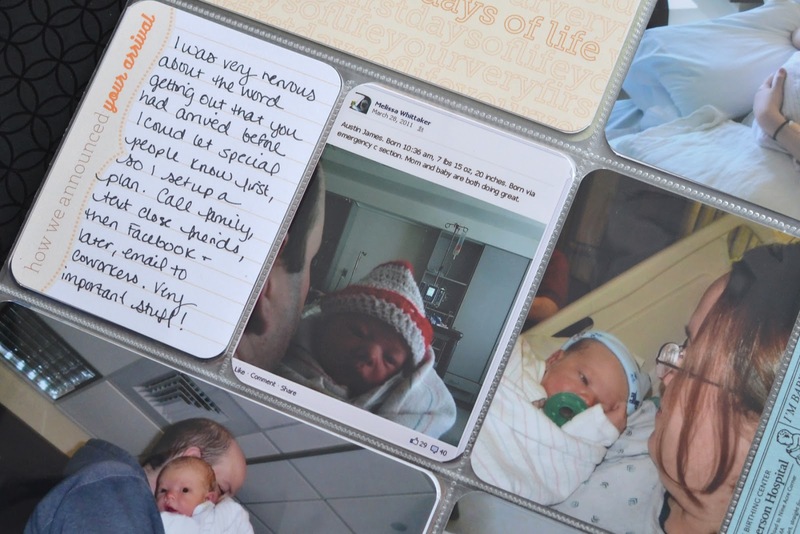 The Project Life page protectors are just amazing for being able to include these special keepsakes. The hospital stay, another favorite spread. This one had a bunch of inserts, so I'll do my best to show them off. Had to include a (perfect 3x4 sized!) 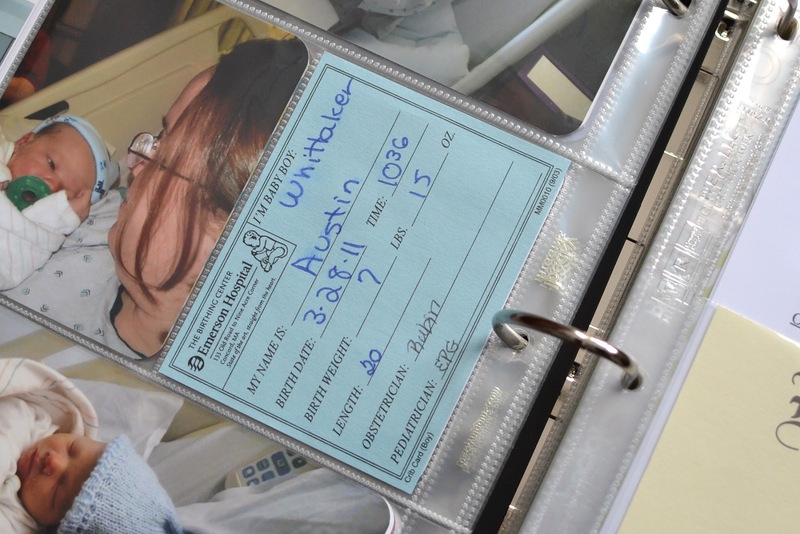 card that was on Austin's bassinet in the hospital. Another great keepsake from those days. Back to Facebook again for a screenshot of the birth announcement. 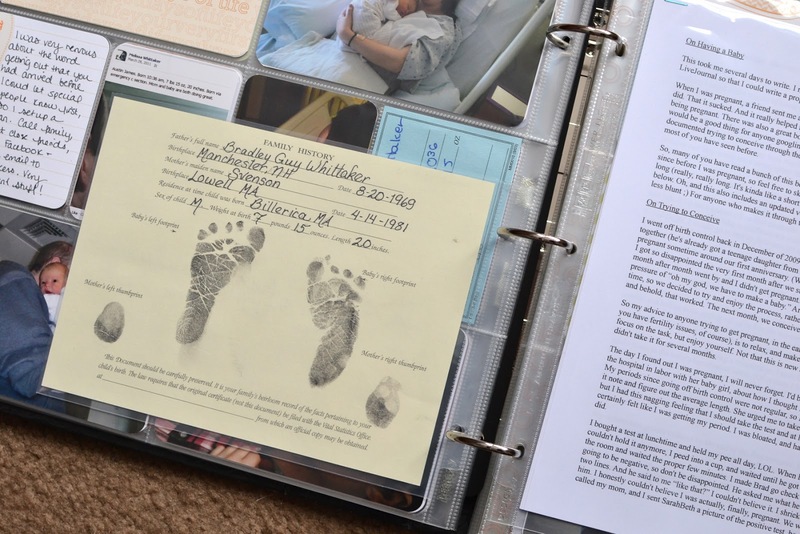 Austin's unofficial birth certificate with his footprints, so important. The next insert (right side in above photo) is a printout of this blog post that I want to make sure to keep. It pretty much documented everything from our time trying to conceive to the birth and afterwards. 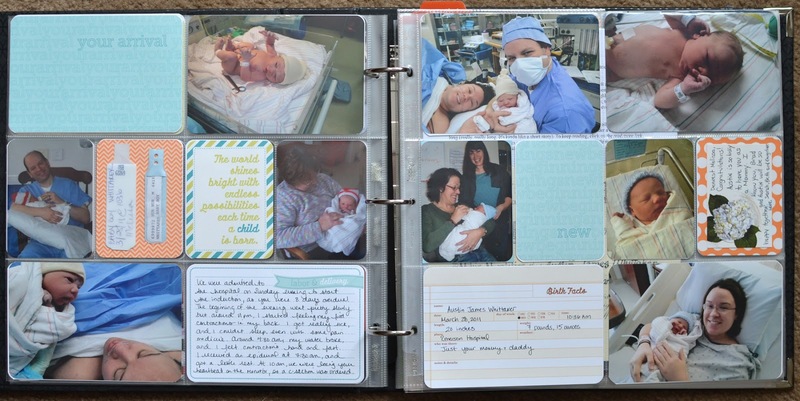 Another insert with photos of his first visitors in the hospital. Special to see my grandmother holding Austin, especially. The back of that insert and the right hand side of this layout. 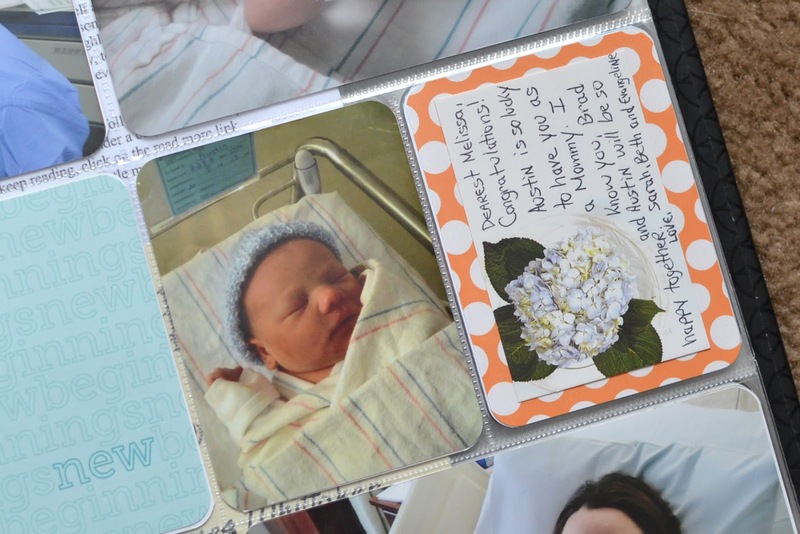 which are all photos and journaling about bringing Austin home. 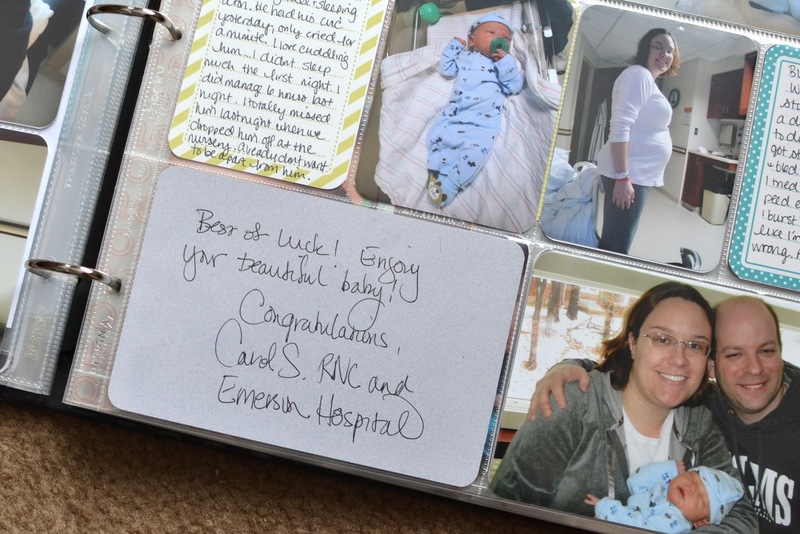 The card and photo that the nurses gave us when we were leaving the hospital fit perfectly in these 4x6 slots. I am using the month cards as I THINK they're intended - to document the first month, second month, etc, not "one month old," "two months old." That seems to work the right way for me if you're documenting an entire year, you'd end with the card that says "birth day," and the whole twelfth month (eleven months old) would be in the slot with the 12. Anyway, this is Austin's first month with us. I had so many photos it actually was hard to narrow down. I am doing two layouts per month (probably with some inserts some months), because there's no way I can fit everything I want to include in one layout. I LOVE that there are monthly stat and milestone cards so I can record his weight and height, as well as the things he did that month. I printed these ones and filled them all out right away. 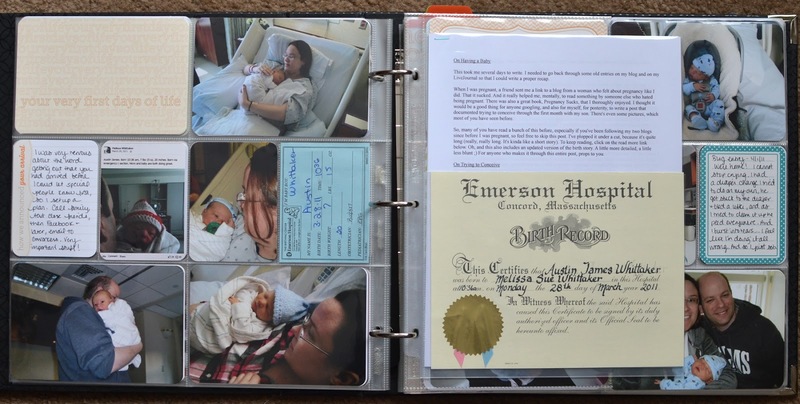 Had to include a copy of his birth announcement, which fits perfectly inside the 5x7 vertical page protectors. I bought vertical and horizontal to use for his monthly photos, which I'd printed in 5x7 size previously. On the back side of the birth announcement, I added a sheet of orange card stock and the print from visiting the Easter Bunny that I didn't want to try to trim down into a 3x4 slot. Also on the right side here is an insert, although it's hard to tell, but it's Design H. The front of it is all about his first baths. That's the back of the insert (on the left), and you can also see the month one divider. LOVE these dividers! The right side of this layout. Lots more pictures of Austin, including one of him smiling at just a few weeks old, and our newborn photo shoot. Another favorite layout, showing off all of Austin's features. On the right side are photos from Austin meeting his California grandparents (Brad's parents) and his first Easter. 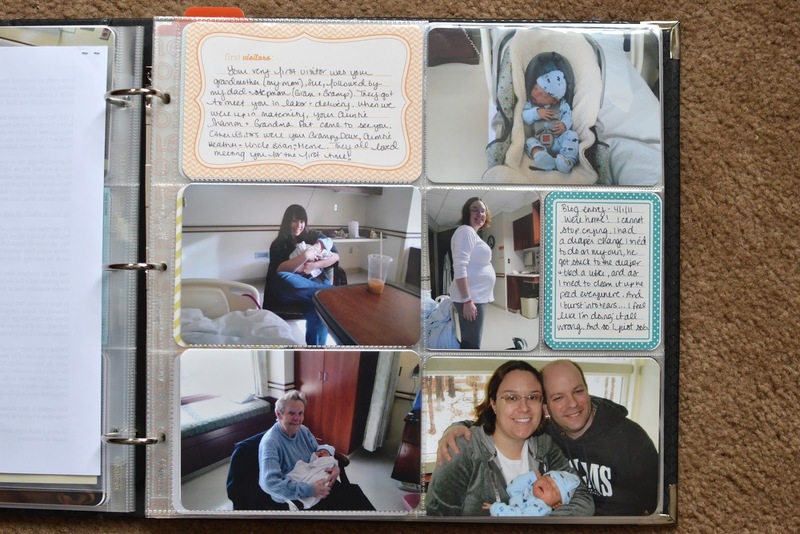 I had previously created a traditional scrapbook page for Austin's features, and I just couldn't bear to tear that one up, so I added it in the back of the album inside one of the 12x12 page protectors. This way I can keep it in a safe place with the rest of his baby album. Whew! Did you make it through all of this? I really loved pulling this together, and can't wait to do the next few months. Some tips - if you haven't already printed all your monthly photos (or if you printed them through Shutterfly every time you got free print codes and then realized too late that they were all not true 4x6 and therefor looked stupid in the page protectors and had to reprint the ones you needed for the album), take each month one at a time. I had the album open, figured out how many photos I needed for that month, and copied each photo I wanted to use into a separate folder on my Mac to upload to Walgreens for printing. I could spend a night pulling photos together and upload them all at once without having to go photo by photo and uploading them separately. I found this much easier. 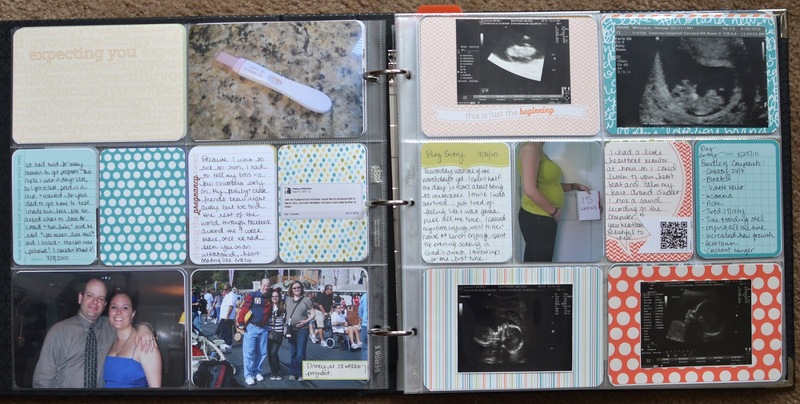 If you didn't journal but did keep a blog through your pregnancy, do what I did and go back through your blog entries to get ideas on what to journal about. Or pull the actual entry and write it down on the cards. I am SO thankful I kept a blog (actually, two, this one, and a LiveJournal) because I have actually forgotten a few things about the pregnancy that I recalled once I re-read my blog. Don't try to include absolutely everything or every photo. If you're anything like me, you've taken thousands of photos of your baby during his or her first year. Choose the most special photos, the ones you just can't stop looking at or the facial expressions you just have to remember, and include those. Get the other parent to write something too. It will be really special for your child to read words from both parents. Finally, keep it simple. Yes, I added a few special keepsake items and some labels over my photos, but you'll notice that the majority of the album are the kit cards and photos, and that's it. 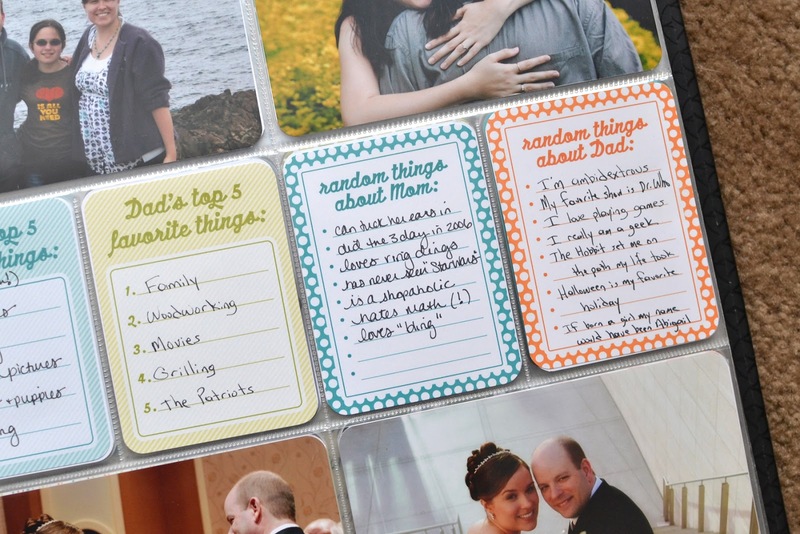 No embellishments or photo overlays (though these and these that I have in my shop would be fabulous, hint, hint!) 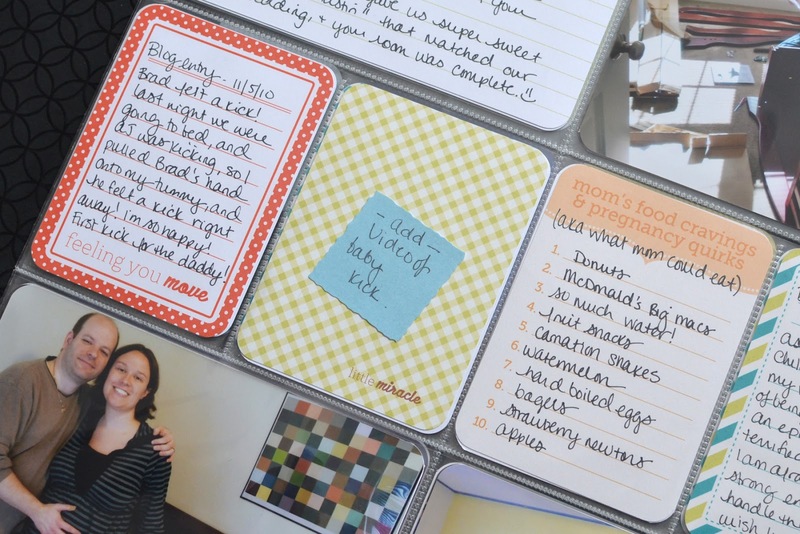 or non-kit journaling cards. Doing that keeps this process quick, cohesive, and fun. 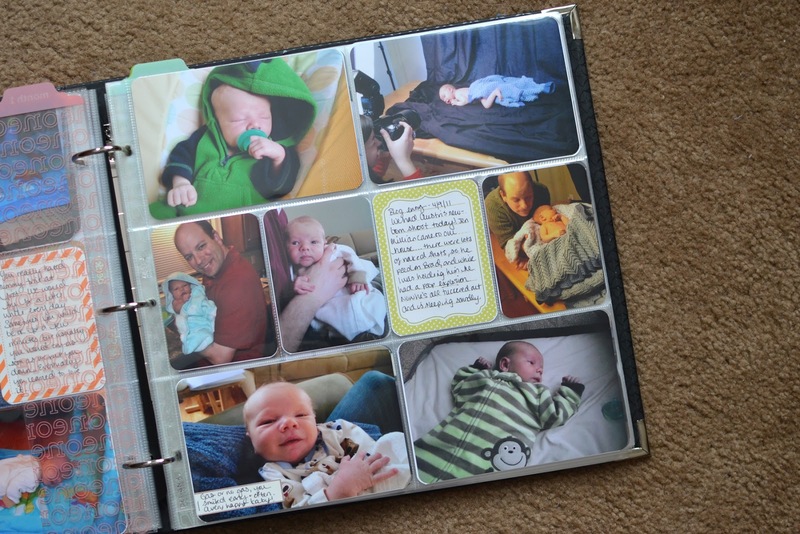 Thanks so much for sharing your album, I've done some traditional scrapbook layouts of my sons, but am seriously considering doing an album like this to get everything into it in a relatively short period of time! Off to check out the digi cards now! It really does go so much faster than figuring out a bunch of layout designs. I had started his book traditionally, managed to scrap a couple of months that way, but I got overwhelmed and stopped after a couple of months. Wow! What an undertaking :-) It looks amazing!!!! I love the colors so much. I can't believe how small he was. Its like, I remember so clearly, but he changes so fast, it's such a blur! Still debating whether to attempt a second year (I just wouldn't use the prompt cards). I'll decide when this one is done! :) His second year is for the most part documented really well in Project Life format so I'm not sure it's necessary, but I like splitting up his life in months! Woah! That will be so fun! I almost (ok, not really) wish I had another baby to do another album for. A girl album would be so cute! You did a fantastic job! I am on the verge of starting one for my son. He's just turned 14 and I'm so worried that I won't remember enough stuff to journal about. I have all of the statistical stuff, but the journaling might be a little sketchy! Thanks for sharing all of your albums...you are truly an inspiration to me! I think when you start pulling out your photos, those stories will come back to your mind. 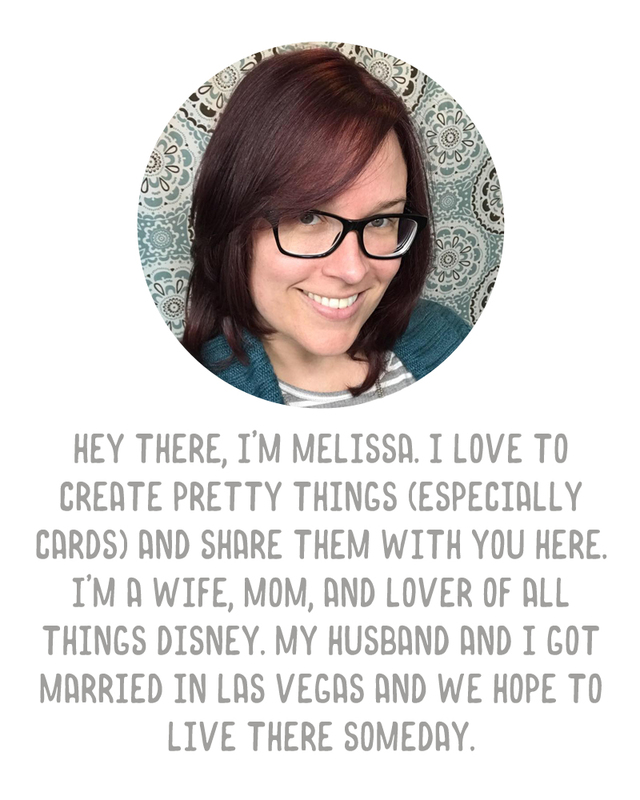 If not, there are PLENTY of filler cards in the baby editions, you could always fill in with those, and add little "titles" (check out my free labels) for the photo if you don't have much journaling to write. But I mean it, I'm sure you'll remember things as you pull those photos out! :) Pictures tell so many stories! Enjoy! Oh that is funny. I was going along wondering why the hospital pictures looked so familiar, until I realized that my daughter and I spent 4 days there when she was 5 days old. Anyway, I love this. I have the gender neutral kit but I'm trying to just incorporate it in to my project life as I go (not do a whole baby album). I kind of wish I'd gotten the boy kit instead because I love the colors. I love Emerson - they really took good care of me and I have such good memories! I love love LOVE this. Can't wait for the other parts of this to come out!! 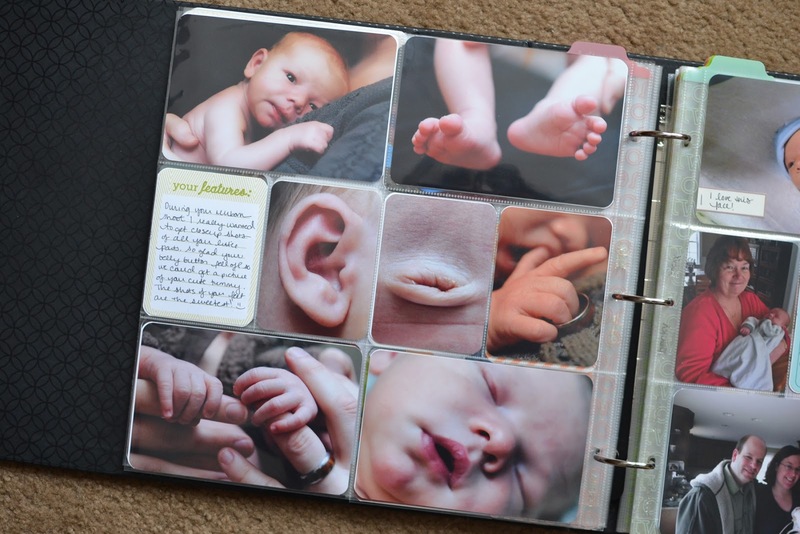 I am in Love with this idea of going back and scrapbooking the first year. I am inspired by this post to do so for my 3 kids. Thank you so much for being an inspiration to us all! 3 will be so much fun to do! You could get a different Baby Edition for each! Thank you for sharing! 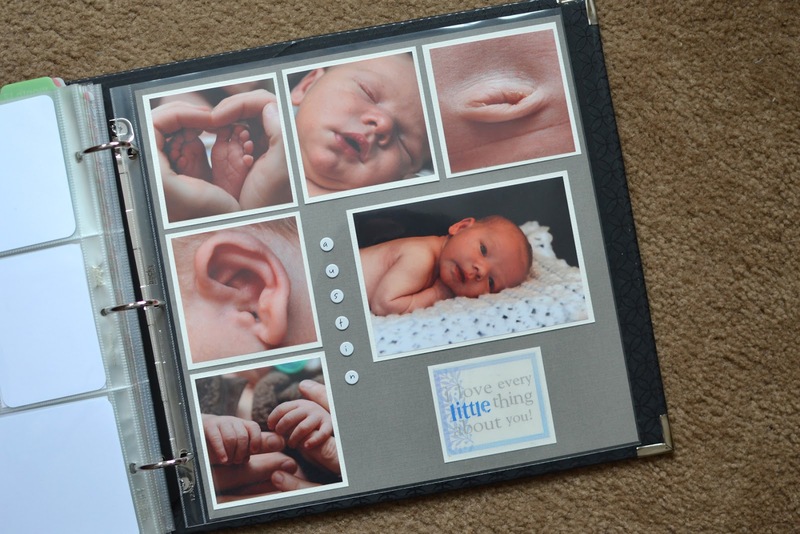 I am using the baby boy edition for nephew (due in May) and LOVE seeing inspiration! What a beautiful heirloom! Wish I could do this for my children, but they're too old and no one really took that many pictures back then. I got my first point and shoot camera when my oldest son was about 4 and took photos sporatically. Now, you seldom find me without a camera......way nicer than point and shoot too (not that there's anything wrong with those)! Yeah, I know what you mean, sort of. I never took many pictures growing up, and my mom's are all buried in her attic, so I see other people documenting their childhood and I'm kind of bummed I don't have many pictures to do. My uncle has gone back and scanned all of my grandmother's old pictures and I'm looking forward to printing those out for an album.